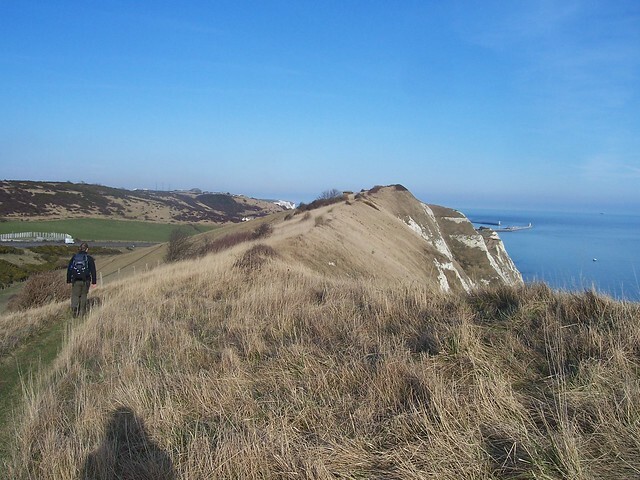 For Catherine, our days walk from Etchinghill to Dover would mark a day of completion. She’d be crossing the finishing line and completing the North Downs Way. Hang on, what are bluebirds anyway? A member of the thrush family that’s native to the American continent? Well what on earth have they got to do with anything then? That song was just some schmaltzy stuff written by two Americans who probably never even set foot on British soil, wasn’t it? Outrageous. Something must be done… Get Vera Lynn on the phone, stat! Oh and the massive great big Eurotunnel terminal too. The tiny village of Etchinghill is just a short hop, skip and jump from the mighty town of Folkestone. Long a fishing port, Folkestone gained a harbour and pier in the early 19th century and with the arrival of the railways, it became a bustling ferry port for traffic to Boulogne. Often overshadowed by its larger neighbour of Dover the last ferries set off for their final departure in 2000 but by then the town had gained another source of cross-channel traffic. In 1994 trains first started running through the Channel Tunnel and it’s from the large terminal site that Eurotunnel’s shuttle trains depart for France. The North Downs Way bustles along on a hilltop overlooking the eight track terminal where cars and HGVs jostle to board the train. Each of the platforms is nearly half a mile long, and the whole complex is connected to the busy M20 motorway. Our B&B landlady had warned us that it would take ages to get out of Folkestone’s sight, and she certainly wasn’t wrong as the town and its facilities dominated the landscape for some time. Even if the trail headed in to some trees, the noise of the place was less easy to escape. Now many of the gun houses and bunker buildings remain, empty and forlorn. A lasting, slightly crumbling memorial to the war. And at Capel-le-Ferne stood another monument: the Battle of Britain Memorial. Officially opened in 1993, the site is dedicated to those of the RAF who battled the enemy in the skies above. We wandered round the quiet memorial site – there were few visitors that slightly grey Sunday morning – slowly taking it all in. Thinking and remembering those that had fought so bravely to keep us independent as a nation. Replica aircraft stood to one side of the sight; a statue of a dog sat, looking out for its master. A large memorial wall stands tall, listing those that died, but the most moving part of the memorial is a simple statue. 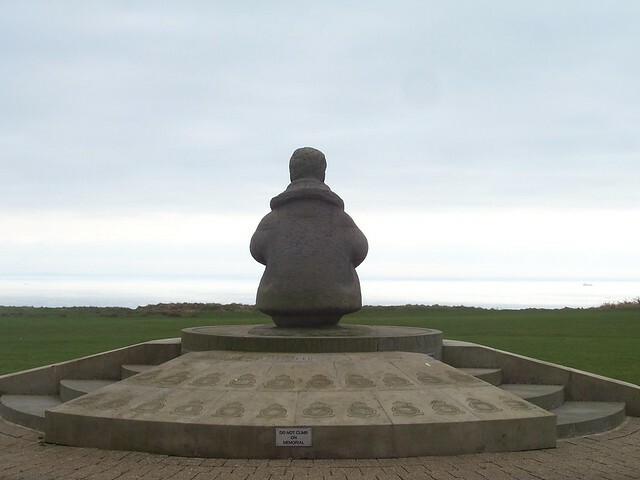 A statue of an RAF pilot sat on the ground, looking out to sea. As we walked along the cliffs the grey clouds began to part. Bright bold blue filled the sky as the sun glistened and glimmered on the sea below. A cracking day for a pint in a beer garden with some nice lunch, and lo, there was a pub on our map! Perfect. We looked at each other, thinking of the large sign outside which had proclaimed “Snacks! Sandwiches! Lunches!” in large letters. “There’s a café up the road,” he went on, no doubt noticing the disappointment in our faces. We knew the café. It was half a mile away. We’d passed by it already, deciding that if we went to the pub we could have a pint too but now we faced a u-turn; going back the way we’d come to get some lunch. Still, the Clifftop Café did at least have the benefit of a sea view and an outside seating area filled with people from the nearby caravan park, happily scoffing burgers and ice cream. 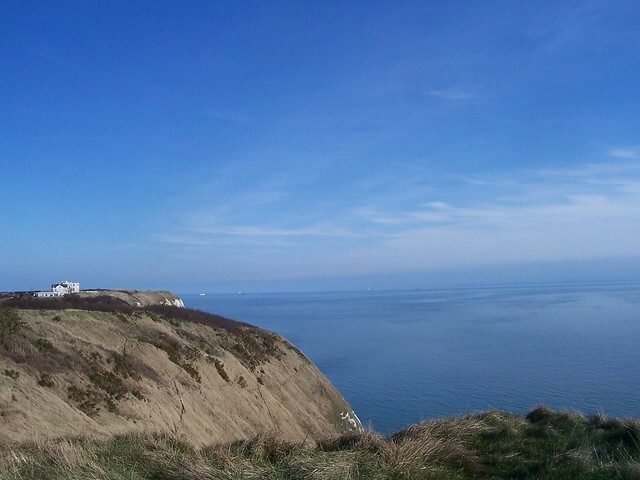 The clifftops were littered with more war remnants; empty bunkers, buildings without windows and, at Abbot’s Cliff, a giant concrete curved dish, stood vertically. 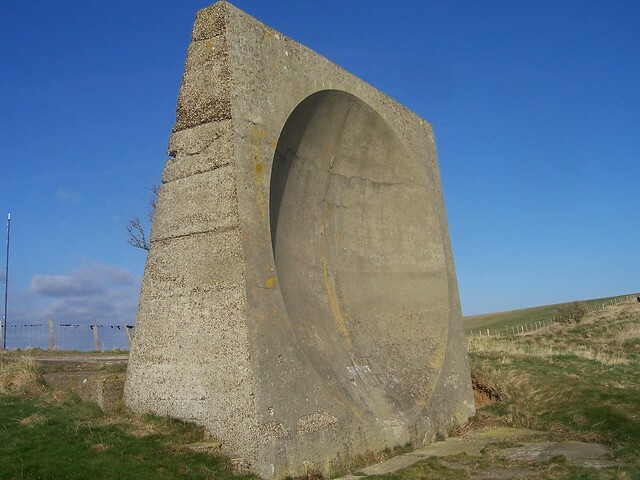 The latter was an acoustic mirror, built in an attempt to detect approaching aircraft by the sound of their engines. Several mirrors were built on the coastline between 1916 and some point in the 1930s. The idea being that they would provide an early warning mechanism for enemy attacks was noise of incoming aircraft would be reflected in the mirror, and picked up on a microphone. The mirrors would allow aircraft to be heard 25 miles before their arrival but by the time World War II started the mirrors were already out of date, replaced by the new technology of RADAR and the Abbot’s Cliff mirror has been resting unused ever since. Ahead of us lay Shakespeare Cliff, named after the Bard who set part of King Lear near Dover, and which is a lump of white chalky rock that would provide us with one final dramatic view before the North Downs Way headed in to the town of Dover. The North Downs Way headed to the very peak of the Cliff, rolling out a view of town’s harbour, along with a view of the busy A20 which takes the traffic to the ferry terminals. Dover’s a place of journeys, but ours was just about to end; a North Downs Way signpost told us we had just two miles to go and the trail headed to the end point with gusto. The trail had one final sight for us to see however; Dover’s impressive Western Height fortifications. Napoleon’s threatened invasion of Britain saw the two forts built in the early 19th century. 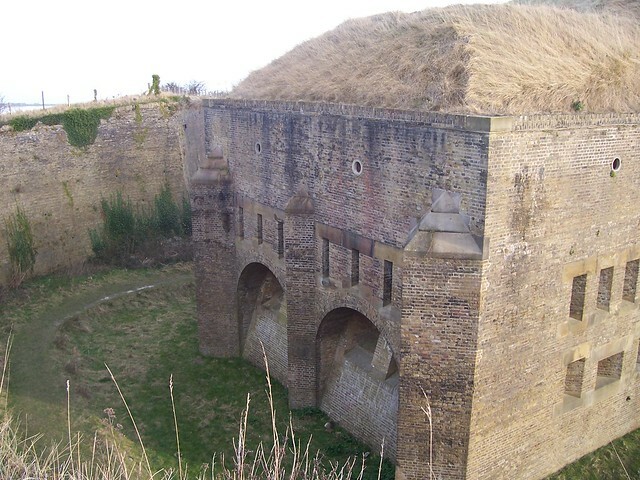 The Drop Redoubt and the Citadel consisted of a large network of forts and moats all sat in the hills at Dover; the barracks in the Redoubt being able to hold up to 200 soldiers and a fair amount of artillery and cannons. The giant, steep moat was designed so that anyone attacking the fort would be trapped and would have difficulty escaping, allowing those inside to simply pick them off from the fort’s walls. That any invading army could simply have bypassed the fortifications and headed off elsewhere didn’t really seem to occur to anyone. The rise of Napoleon III in the middle of the century saw the fortifications extended even further, and during World War II the Redoubt housed a team of commandos who would have been tasked with destroying Dover’s harbour in the event of invasion; their existence kept a secret throughout the war. The North Downs Way passes close by the Drop Redoubt, but its sister fort, the Citadel, certainly isn’t accessible. Whilst the Drop Redoubt now lies empty, the Citadel was taken over by the Prison Service in the 1950s. 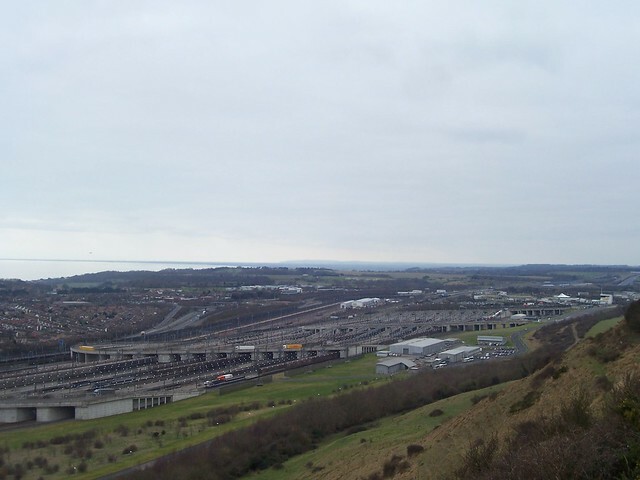 Later becoming a borstal, the buildings now house Dover Immigration Removal Centre, a secure facility for appealing and for failed asylum seekers. Through the streets the North Downs Way now went; into the town centre and the point where the southern loop met the northern. Whilst it’s moved since, in 2009 the official end of the North Downs Way was firmly in the town centre. A sign and a bench near a fountain and a pound shop marked the end of the walker’s journey. Those, like us, wishing to celebrate by resting their feet would be disappointed on that day as they’d been colonised by a group of teenagers, puffing away furiously on their cigarettes. Not that Catherine seemed too worried. 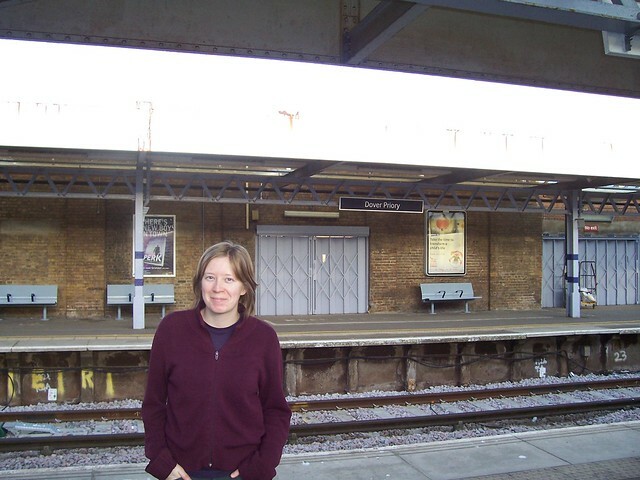 She celebrated instead with a photograph on the platforms of nearby Dover Priory railway station before a train whisked us back to London. As for me, well I’d like to say I reached Dover and said something profound, but I didn’t. Why would I? It would take two and half years before I’d set off properly on my own travels on the North Downs Way, and even longer before I made it back to Dover again. And whilst the end of the North Downs Way had moved in that time, when I did arrive back there three and a half years later, that same set of teenagers still seemed to be sat on that bench. Folkestone is spelled with an “e”!!! Oh rats. So it is. Should all be corrected now! I have a little time in England this Aug-Sept and would like to walk say 3 days, away from main roads! I had thought a chunk of this Canty to Dover sounds good, but would like advice on which bit/s or an alternative suggestion. I plan to tent it, but maybe a pilgrim church as well? Hello JD – of all the North Downs Way sections, for a three day walk I’d definitely recommend starting at either Canterbury or Hollingbourne, and walking the southern loop to Dover. It’s a great stretch. Definitely. Thank you for your chat on each section too…..very welcome…. Please ignore my last email…. I think I measured the distance from Etchinghill Tower…and not the village itself. I walked from Sandling Train Station to the Tower and then started the leg from there….hence the additional km’s…..
First Published: 28 February 2013. Last Updated: 24 November 2014.